Through My Eyes: October 2014 » Lavi was here. October. It’s brisk outside but I’m just heating up here in Spain. This first full month living in Madrid was rad. Regular 3-day weekends has given me the freedom to explore Madrid and travel to other cities in Spain and Europe, and I’m finally taking full advantage of my time here. The only word that comes to mind to explain Granada is unreal. 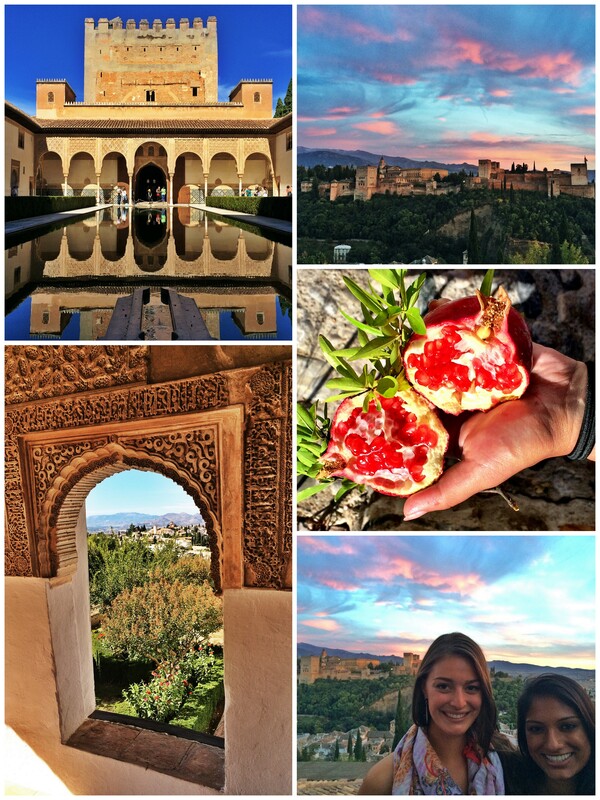 I loved this city so much that I had to share 5 reasons why you gotta go to Granada. Seriously, Granada is my favorite city in Spain, so far (sorry, Madrid!). From the food to the history, it can’t be beat! I managed to do a lot of things this month in Madrid! I’m a pro at this…not. I went to an espicha, or cider party. It was basically an excuse to drink copious amounts of cider from the northern Spanish region of Asturias and eat lots of delicious Spanish food! You can check out the next date for this event here. Bottled without gas, Asturian cider must be poured by holding the bottle above the head to aerate it. You’re also not really supposed to look at the glass while you pour it (so you’re not supposed to look like I do in the photo above), but I couldn’t help it! Also, you’re never supposed to pour for yourself. Pour a glass for everyone else and have someone pour for you! The camaraderie of the event is awesome. The floor of the bar was covered in a cat litter-esque substance to soak up the excess cider. By the end of the night we were all a mess, but it was so fun! 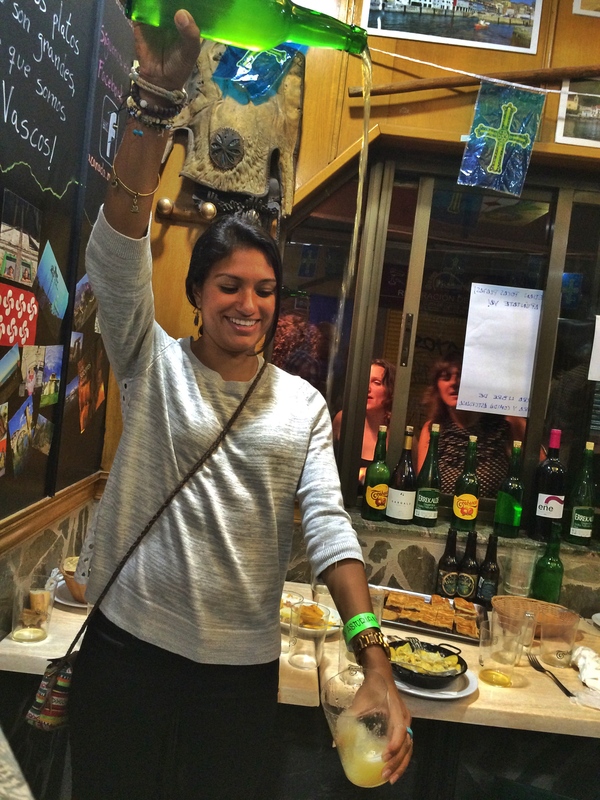 I can’t wait to try this again when I eventually go to Asturias! 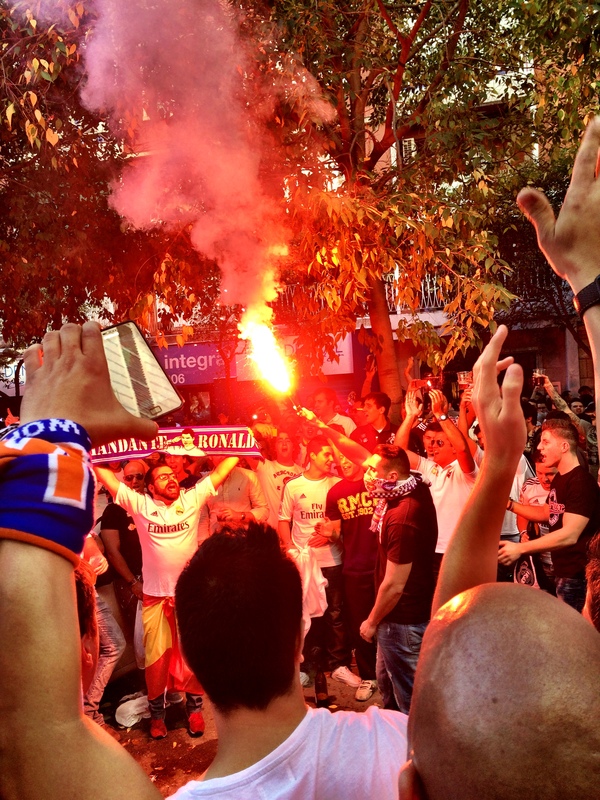 Real Madrid fans don’t mess around! Or rather, they do…with flares. 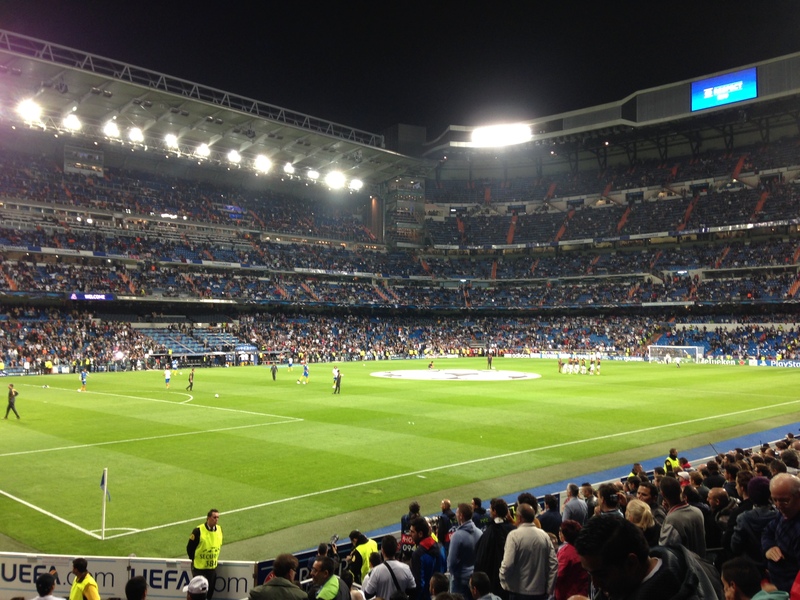 I was lucky enough to be in Madrid to experience El Clásico, which is the fútbol match between Real Madrid and Barcelona. I didn’t go to the match, but I did go to Estadio Santiago Bernabéu (the Real Madrid stadium) to partake in Spain’s version of tailgating. Let me tell you, it was mayhem. People were lighting flares, throngs of Real Madrid fans were chanting and cheering, and I would have been seriously afraid if I was Barcelona fan. This was one of my favorite days in Madrid so far and reminded me of my first experience at the stadium last year when I was able to get an 18th row ticket to see Real Madrid v. Juventus on my first visit to Madrid. I’ve been a fan ever since! Faced with the somewhat daunting task of organizing three full days of Halloween for the entire school, the other language assistants and I were hard at work organizing activities and decorating the school. We played a little pin the tail on the cat, danced to Thriller a million times, painted faces, and ate candy. Halloween is not a big holiday in Spain, but the kids really enjoyed it. The best part was that a few of the students’ mothers dressed in costumes and scared the crap out of the kids when they entered the library. There were a few criers, but it was a huge success. Through my eyes, October reminded me that it was exactly at this time last year that I visited Madrid for the first time. I had no idea that I would be living here one year later. It’s amazing how time flies. Where will I be next year? What’s next? I planned a pretty amazing November. I will be traveling back to southern Spain to Córdoba for a weekend, and Rome! I am so stoked to finally hitting one of the European destinations I planned to before moving here! Sounds like you’re having a fine time of it on the peninsula, Lavi. However, if you ever tire of the mainland, you have to come and check out Spain’s islands. Starting with, ahem, Gran Canaria? Pingback: Braving the Elements: A Road Trip to Asturias - Lavi was here.